We know massive job losses are coming—and shockingly soon—yet for the most part, we seem to have our fingers in our collective ears. Ed Hess wants us to stop pretending nothing’s going to change and start preparing for the biggest culture quake since the Industrial Revolution. If you’ve been paying attention at all, you know massive changes are coming to the world of work. Specifically, a “technology tsunami” is roaring our way, poised to wipe out tens of millions of jobs. In fact, researchers at Oxford University predict that 47 percent of all jobs in the United States are likely to be taken over by technology in the next five to fifteen years. And the chief economist of the Bank of England predicted in 2015 that the U.S. could lose upwards of 80 million jobs during that time frame. Whether or not these predictions pan out to the exact numbers, the massive job loss will surely be huge and will impact many of us in profound ways. So why aren’t we doing what we need to do to prepare? Ed Hess says we seem to be suffering from a severe case of denial. Here are five of the vital conversations Hess says we need to make happen. CONVERSATION 1: What can I do to stay valuable and employable in a world where jobs are scarce? Simply put, you must start today upgrading your skills so that you can excel at tasks that smart machines won’t be able to do well. Those skills involve thinking critically and creatively, diagnosing and solving non-routine problems, and rendering customized personal services that involve emotions to other human beings. For example, learn a trade skill that requires real-time complex problem solving and complicated human dexterity; train for a service job where you have to emotionally engage one-to-one to meet people’s individual needs; train to repair smart robots; learn to excel at working as part of a team thinking creatively to solve problems; or get into a technology job and upgrade your skills every year. Start today building your “Lifelong Learning Toolbox” because technology will keep advancing and you will need to excel at constantly upgrading your skills to stay ahead of it, advises Hess. “Use the Internet to expose them to new places, to the mystery of science, to making stuff, and to different ways to learn so they learn how to be comfortable in figuring out how to proceed in new situations,” advises Hess. “Teach them to be curious, to learn something new every day, to read every day, to have the courage to try when failure is a possibility. All of these things require that you role model them; don’t just preach them. “There are many institutional, political, economic, and personal reasons why many of our public schools are stuck in the Industrial Revolution model of educating,” says Hess. “They will have to change because they are vital to the creation of opportunity for every child in our society. That is what our country has stood for from its founding. We can’t lose that. Installing smart technology in every part of their business and training their employees to use it effectively. Creating a humanistic people-centric work environment (culture and processes) based on three psychological principles: Positivity; Self-Determination Theory; and Psychological Safety. This will enable the highest levels of human cognitive and emotional performance in concert with technology. Transforming leaders and managers from directing and commanding people into enablers of human excellence. You can’t command and control or direct humans to excel at the higher-order tasks that technology won’t be able to do well. Transforming their employee training programs into human development programs focused on not only teaching specific job skills but also teaching workers how to think; how to use data to make decisions; how to quiet their egos; how to be non-emotionally defensive; how to reflectively listen; how to relate and emotionally engage with others in ways that build positive regard and trust; and how to create and work effectively in teams. CONVERSATION 5: When 80 million jobs are lost to technology, it stands to reason that a lot of people won’t be working. In the absence of work, how can they live meaningful lives? This will be one of the biggest existential challenges the Smart Machine Age will lay at the doorstep of the United States. We are a culture dominated by individualism and the survival of the fittest. We will need a different approach that promotes a “we all are in this together” community mindset if we’re to maintain social tranquillity and our way of life. We must answer the question: In a world of smart machines, what type of society do we want to be? We will need a new story—an American Dream 2.0. That will require leadership and an inclusive national conversation. That conversation needs to start now because the smart machines are coming soon. “We will have to learn from our ancestors—how did they find meaning in the ‘hunter-forager’ days?” asks Hess. “How did they find meaning in the Agricultural Age? How did they organize? How did they choose their leaders? How did they govern themselves? How did they appeal to and promote the best of what human beings were capable of doing? Hess admits he does not have the answers. No one person possibly could. What he does have is a mission to get these conversations started so that together we can come up with the answers. Ed Hess, Professor of Business Administration and Batten Executive-in-Residence at the Darden Graduate School of Business, and Katherine Ludwig are the authors of the new book Humility Is the New Smart: Rethinking Human Excellence in the Smart Machine Age (Berrett-Koehler, 2017), which puts forth a new model called NewSmart, designed to help humans thrive alongside technology in the Smart Machine Age. For more information, please visit www.edhltd.com and www.katherineludwig.com. 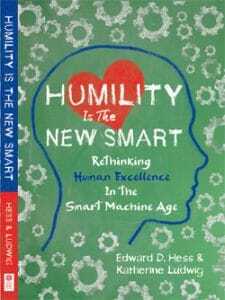 Humility Is the New Smart: Rethinking Human Excellence in the Smart Machine Age (Berrett-Koehler Publishers, January 2017, ISBN: 978-1-626-56875-4, $27.95) is available at bookstores nationwide and from major online booksellers.